The first place I hit when searching for nooby goodness was Elate! I had remembered something being said that there was a package there, so I thought why not try it out. This package is perfect for a new avi starting out, and wanting some style. I'm very VERY impressed by the shapes in this package. There are 3 all together, as shown here. The Emma Shape 1(Left) is tall and modelesque, but somewhat more teen in feel to me. Emma Shape number 2(Middle) is like #1's older sister, with a more mature body shape, defined nose, filled out cheekbones and more muscle mass. Emma Shape Number 3(Right) has a shorter stature, more curvey figure and seems to be one of the most beautiful shapes I've seen in a long time. All around I love these all. I don't buy shapes on my main account, I've custom made my own, cause often the faces make me cringe. But these are so well done, I'm almost sad I can't have them on my main. Tho I'd have to reshape all my hairs, ACK! You can see the slight facial differences here. Emma Shape 1 to 3 form Left to Right. You get 4 Emma Skins in the package as well. 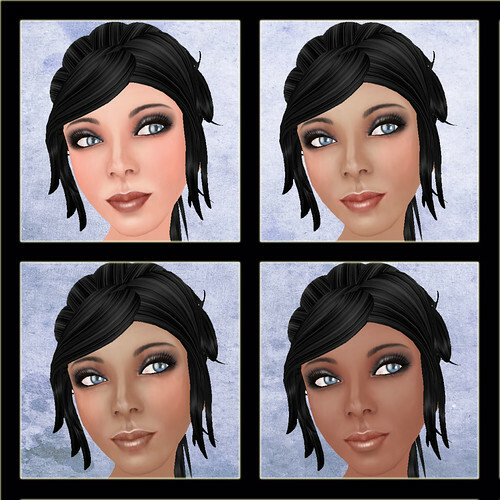 There are 4 tones, a nice way to start your adventures in your second life, with a choice. Here is the closeup of the makeups. I have always been uber picky with lips, and these are just wonderful. A frosty lipgloss with a blushed base. Great Shaping. If the shapes and skins were not enough, you also get a outfit, and with choices! You get the shirts, in basic black and white, in all layers. They are mod, so the white is tintable, giving you even more options. There is a skirt, with not one, oh no, but 2 options. You have have the flexi or the basic tighty. All in all it this pack made me super happy, and will make your new avi, or noob friends have a very nice start. Here is my Main Account(Helena Stringer) modeling a dress you will find at Elate!. Not a free item, but just a look at the quality of fashion that is out there for you guys, once you get full immersed into your new world. Unless the owner of the dress shop that made that last shop happened to get permission from the artist who created the scarf of rose.....(a real life artist with felt) that last dress is an issue. Adding the small roses does not allow the copyright infringement. I thank you for your concern, but that's like saying I can't make hair inspired by an actress. The item inworld is not the same as the one in rl. Nothing in life is original. Should I say that person is infringing on nature because they put fake roses on their garment? Fashion is always inspired by fashion, I could amost garentee that that person got the idea off the runways. We don't patent fashion like we do inventions. Fashion is freeform, we all get to play with similar ideas. I do feel sorry for you tho, to see it the way that you do. Thanks for your opinion. The owner of the shop has a copyright on the design, that's the only reason I brought it up. Its a design that was copied once before and nearly immediately taken down when the owner of the design contacted both your group and the designer in sl. Saying it is like making hair inspired by an actress is not the same at all. There is no copyright on a hair cut. There is a branding of sorts, but not actually a copyright. As an artist myself I know nothing is origional and when I create I try to research my designs after I come up with them to make sure it's not something I've seen and only half way forgotten, or that it too closely resembles another artists work. As for your comment about being sorry for me, I feel that was unnecessary as it spoke as though my concern was only opinion based not fact based. I have contacted the artist with the copyright and will let her handle the rest if she so sees fit. It always seems like it turns into a fight on these things, and honestly thats not what it's about. I know you were attempting to establish a fact, and yes she does have a copyright, a more recent one. There is a dolce and gabbana dress, in Vogue, more then 6 years back, that had roses much like the 1,2 and 6 in the link you have found. They too had a version that was a pink tipped petal that went to a pale yellow at it's base. "Note to other Felters: I know what it is like to be inspired by work but it is also important to make a piece your own. So please, if you're going to do something like my pieces, you need to change it enough to make it your own. Change the colors, change the size, change the image that you market it with, put a button on it. Do something, because I do have a copyright on file with the US Copyright Office and I will pursue legal action if you infringe on the images and products that you see on this site." I will be contacting this person personally, since she seems to have a good head on her, and understands the laws of design. She will understand when I show her my mag pics, that someone could have been easily been inspired by something that came before her time as a designer. I'm sorry that you felt I stepped on your toes. It's almost funny, cause I always tell people that they don't research enough, and here we are. Yet again. Any further comments you wish to make, please contact me inworld. I'll be deleting these within the next few days, seeing as they do not pretain Free*Style as whole. I expected you to delete these almost immediately so deleting them does not bother me. I only felt you "stepped on my toes" when you said you felt sorry for me. I can appreciate that someone has been inspired by something else. Thank you for looking into it further. I know these things always seem to turn into a fight and I did not intend for it to do so, so I am sorry that my last post of the evening may have come across wrong. I typed it and re typed it trying to make it not sound like an argument but rather a debate. I suppose my being irked that you would say you felt "sorry for me" and thus make it a more personal issue overrode my tone. I adore your blog as a whole and only said something because I'd seen two items before that were obvious copyright issues with designs taken from artists on that site. It's one of the big flaws of that site, it's too easy to rip an artists work. I feel the same way with the Sims2, people often bot skin designs from the free files you can recieve and translate the to the linden templates. I think we ended this on well enough terms, I will keep this all up, so someone may learn from it. People sometimes like to jump, on both sides, before they see where they are going. 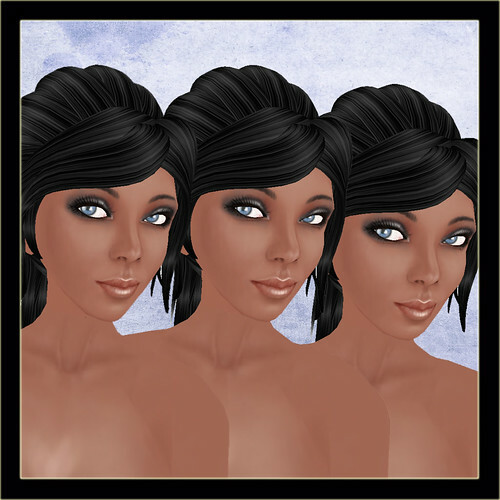 I hope you enjoy your second life, it's is such a great artistic outlet for all of us. Thanks Skyee, got the package and will post it soon, it'll be on next weeks list aswell. Does Adam N Eve still offer a new player pack? And I know for a while they had a voucher for a free pair of shoes for new players, but they might not anymore. I am the designer of the rose-collared dress, and I assure you that I never saw the rose collars on Etsy before the creation of my dress. I don't usually visit Etsy so it's unlikely that I would have even come across them. I made this dress when I was first learning how to sculpt prims. A rose petal is a rather easy shape to make. I in fact made a lot of versions of that dress, all of which incorporated the petals (in the skirt, the collar, anywhere they'd fit). The version with the collar was the most popular with my friends so it was the one that made it to the storefront. In fact, since my release of the dress, I have seen another dress with a rose collar on a real life runway and chuckled that I had started a trend. I don't think it is that unusual to use the rose detailing. I wish, Ekio, that you had contacted me personally before accusing me of copyright infringement in such a public place. Please understand that I would never intentionally copy another designer's work! Also, to further clear up the matter...Those rose collars on Etsy were all put up in 2009. My Maria dress was released December 2008. I think this should settle the matter. Personally I thought Helena and I cleared the air ourselves and I want to make it known that I did post a reply to you Kellie in private as well when you posted this here. I can understand where your coming from as well. Also, before you state that the collars were posted only in 09 you should double check that fact. The seller has listings that she frequently relists so the listing date is not correct for the origional item. The shop has been open much longer than that and so her design was around before your dress. I had one of her roses on my christmas list this last year as I love them. I do not want this to become a disagreement again in the comments and I will not be checking in again on this subject. I only simply wanted to state the fact that your information on the seller was incorrect as you did not research it as to help clear the air. Well, I think we've established that there are to be no further designs in sl made with roses. Kellie, keep the chin up, you're extremely talanted, and things like these, well, errr, they come with the package of having talant.